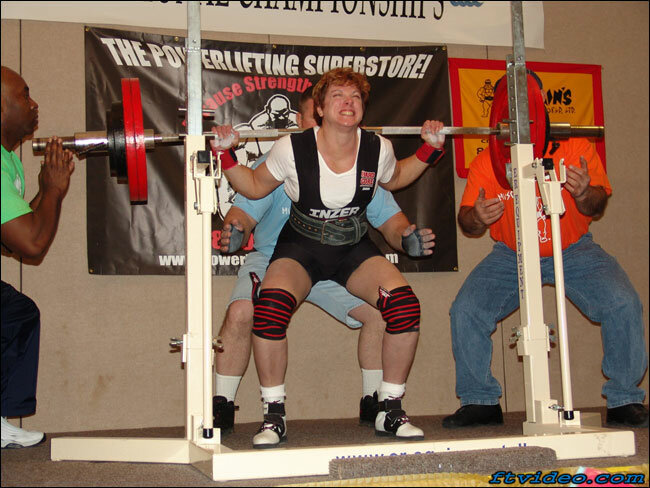 Lynne won both the 165lb Open and Master classes at this year's USAPL Woman's Nationals. 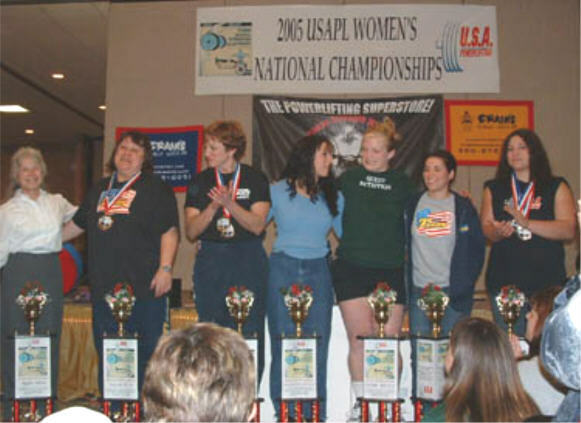 This year in St. Louis, Lynne totaled 1026 and was able to win both the Open and Master Classes at the USAPL Woman's Nationals. According to a well experienced lifter and multi-national, and the current 148lb world champion "Master Lifters aren't supposed to win the Open division. There were over 160 women lifting, which made this the largest turn out for thi competition. It has become the most prestigious woman's meet in the country. Lynne had lifts of 220 bench, 341 squat, 465 dealift. She hit her first squat, missed her second (depth), and hit the 341 on her third.Her bench was strong, with her going: 193-209-220lbs. She had more in the tank as they say. Her squats were: 314-341(Miss),341. she struggled with the squat the last 3 weeks of training, so 341 was good considering. The deadlift, was as usual, the strong lift. She had a series of 429-440-465, with at least 20-30lbs left. it is just so hard to judge her. when she feels bad she does great, feels good, does not do as well. After the squat and bench Lynn was down 20kgs. So when the deadlift started Lynne opened at 429, and had opened up a 10kg lead at the end. In winning she qualified as a member of both the USAPL World Open and Master teams. She has decided to go to the World Master competition in Pretoria S. Africa. She so deserves all the accolades,praise, and recognition, as do all of the winners and competitors at the meet. It was truly a great weekend. Again to Priscilla, thank you for showing an interest in Lynne and not slapping me silly when I forgot to find out what the world record was. Never Again! These are the "Best Lifter" winners at the meet.That is basically the 2005 USAPL team for the world Championships in Finland. Harriett Hall and Lynne qualifies for both teams. Much talent, strength, and experience in that picture. Good Luck To You All At Worlds. Hey Lynne! Is That Old Guy Your Father ?